Read about Olive's success at the end of this text . The Forest Group Consists of 11 WI’s , which include the following WI’s , Bunbury, Darnhall & Wettenhall, Delamere, Duddon & Clotton, Eaton, Kelsall,, Little Budworth, Peckforton & Beeston, Tarporley, Tarvin and Utkinton. The Group was formed 70 years ago to enable WI’s to have the availability to hire more expensive speakers and join together in fellowship. The first first Spring Meeting was held on Monday 14th May 2018 at Tarporley Community Centre, under the new committee of Irene Wilkinson, Margaret Matthews and Nancy Williams , of Tarvin WI. The guest speaker was Jean Martyn, who is a Concert Organist and Pianist. Jean came 3rd in the Britain's Got Talent Show in 2011 and has toured extensively since then and the the poster below shows Jean performing . 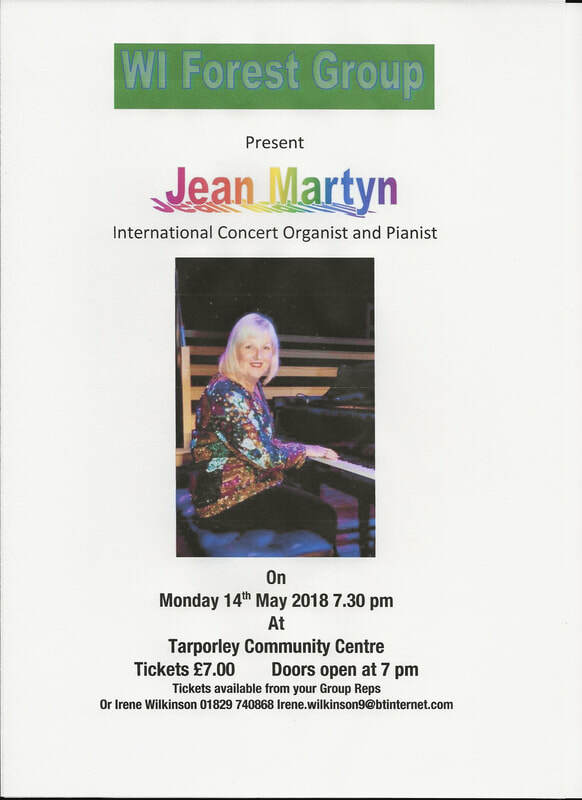 Jean was a wonderful entertainer, and as well as playing a very wide repertoire of pieces on her electric organ, she entertained us with anecdotes about her life, and how she came to enter BGT, and become a regular entertainer for the Royal Family . The competition for this meeting was to 'make a musically inspired flower arrangement suitable for a dinner table'. 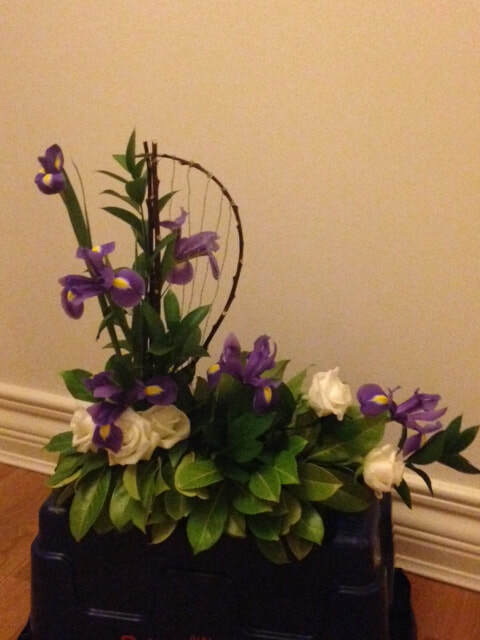 Olive​ had been asked to represent Kelsall , and , to the delight of the Kelsall members present, her beautiful arrangement, including a meticulously-made harp, won . Well done , Olive!